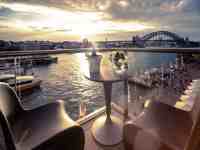 An all-suite luxury hotel on Circular Quay with breathtaking views over Sydney Harbour. Walk out of the hotel directly onto a ferry to Manly beach, or stroll the cobblestone streets of The Rocks to sense its historic past, or enjoy its shops and restaurants. 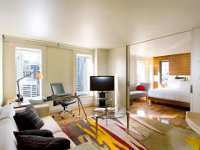 A hotel from a well-known international brand, right in the heart of Sydney's main business quarter. Shopping and renowned local attractions are nearby. Everything you can expect from a top luxury hotel from contemporary, comfortable rooms to fine dining. An historic 19th century building turned into a luxurious hotel overlooking the Circular Quay, the Harbour Bridge and the Opera House. This is the heart of downtown Sydney, with some of itse best shopping and fine restaurants. A perfect place to stay! Enjoying spectacular views of Sydney Harbour, its Bridge, and the Opera House, it is ideally located for the best shopping, tourist, and historic areas of Sydney. The hotel offers all the amenities expected from a top 5-star Marriott property. Spacious rooms with free wi-fi in the central business district, easy access to the Sydney Convention & Exhibition Centre, and to the tourist highlights of the city, makes this hotel a perfect choice for business or leisure stays. Strategically placed in the central business area of Sydney, it is also convenient for the famous landmarks of the city. Enjoy a wide range of comfortable rooms, fine dining, and a health club with an indoor pool in this boutique hotel. On the beach and near everything, yet in quiet location. 30 minutes to Sydney downtown or the airport. Walk to Bondi Beach along coastal path (4 miles). Outdoor pool and in-house restaurants and bars complement wideranging nearby entertainment. Set in the historic Rocks area, surrounded by excellent bars and restaurants; a short walk to the Harbour Bridge and Circular Quay, with easy access to the Opera House. This modern hotel enjoys one of the best tourist locations of Sydney. The luxury brand of the major French hotel chain, occupies a landmark building in the main shopping area of Sydney. Within a short walking distance of the famous tourist attractions around Sydney Harbour, and of the Central Business District. Centrally located apartment hotel with fully equipped kitchnettes, and interconnecting rooms ideal for families large and small. Enjoy the green spaces of Hyde Park opposite the hotel, and the recreational facilities inside, which include a roof-top pool. With spectacular views of the Harbour Bridge; five minutes away from the city centre by underground transport; Bondi Beach is 15 minutes's drive from the hotel. Safe parking, restaurant, bar, and fitness center makes this a good choice for a Sydney stay. Darling Harbour is a pedestrian and entertainment area surrounding the wharves used by local ferries. The Central Business District, the Harbour Bridge, the Opera House, Chinatown. and many other attractions are within walking distances from the hotel. Away from the bustle of Sydney centre, close to the M2 motorway, the hotel serves both leisure and business travellers. Close to the Macquarie Business Park, and University, from where up to 4 trains per hour whisk you to Sydney in under 40 minutes. An economical hotel from an international chain, a short walk from Darling Harbour with its exciting mix of entertainment, bars, and restaurants. The Opera House, Harbour Bridge, and ferry rides to Manly from Circular Quay are all there to be enjoyed. An inexpensive hotel offering all basic modern facilities in King's Cross, the fast becoming up-market residential area. It is a hub for bars, cafés and night-clubs, yet just over a mile from the central business district, and Sydney Harbour.